After reading missmsian’s post on free and cheap things to do in Toronto, I wanted to write one for my adapted “home” Montreal immediately. For someone recovering both mentally and financially from grad school, the city has offered numerous diversions and fun nights which often don’t cost a thing. Sure, the streets are a little grungy, the construction may be ongoing, and the French might sound weird to non-Québecois ears, but the city is literally full of things to do for 10 dollars and under. 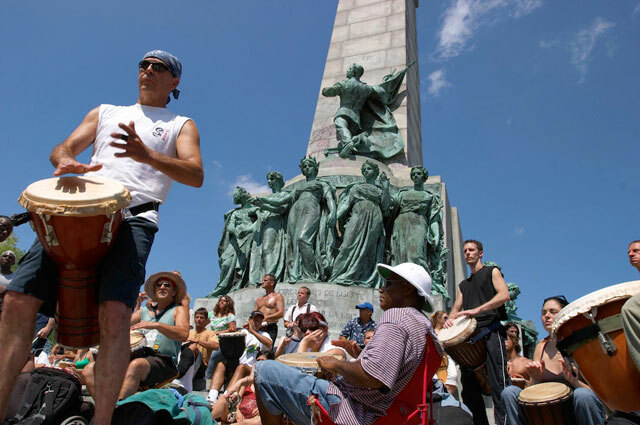 Every Sunday in the spring/summer*, Mont-Royal park is filled with a drum circle that goes on almost all day (anytime between noon until 8-9pm), medieval live battles, line-walkers, jugglers, and picnic-ers out to enjoy the spectacle and the beautiful weather. Want to see a guy in full samurai armour battle against an aspiring sword-wielder (made out of duct tape and broom)? Check. Sketchy people whispering “weed” on every corner of the mountain? Check. Handmade jewellery? Check. It’s a truly unique event to Montreal and a great place to people-watch. The Contemporary Art Museum presents many exciting multimedia pieces and interdisciplinary exhibits, including past exhibitions like Sympathy for the Devil – which examined the intersection of rock and art. Admission is $10 for adults and $6 for students, or free every Wednesday evening from 5 p.m. to 9 p.m. The museum has also started a special series called Musée Nocturnes with live music performances (one of them featured the dynamic Tune-Yards, whose live performance will seriously blow your mind) every first Friday of the month, which can be enjoyed with a regular admission ticket. The permanent collections at the Museum of Fine Arts are always free to the public. And while exhibits will cost $15 for adults and $7.50 for students, the museum still makes it under the $10 mark every Wedesday evening (5-8:30pm) when it offers half-price admission . Don’t let the somewhat restrictive name fool you – the museum offers a diverse range of exhibits – from the beautiful art of J.W. Waterhouse to the love story of John Lennon and Yoko Ono – and collections. Last year, Montreal rolled out Bixi bikes – public rental bikes with stations all around the city (with the exception of the Westmount borough). You can sign up for a yearlong membership for $78 (which comes with 6 transit fares until Jul. 30) and enjoy the beautiful scenery of Montreal instead of smelling someone else’s armpit on the bus or the metro. It’s great for visitors too – it costs $5 to use the service for 24 hours. This means that you can use a Bixi bike to ride for 30 minutes or under each time (be sure to check the time – the service will charge a $1.50 fee if you go over the designated half-hour time). It’s a handy way to get around the city and much more economic than using the transit system, too. Make a day of biking to different areas and exploring the distinct neighbourhoods of Montreal. Every Sunday in the summer, Parc Jean-Drapeau (a short metro stop away from the central Berri-UQAM station) becomes a big dance party with 6 hours of electronic/house/techno beats by artists from Canada, US and Europe. It is as fun and exhausting as it sounds, all for a modest cost of 10 dollars. Located near Lionel-Groulx metro station, this beautiful canal has great waterfront green space ideal for a picnic and a bike ride. It’s also home of Atwater Market, one of the Montreal public markets, where you can buy locally grown produce or delicious Quebec beers such as La Fin du Monde and L’Éphémère Cassis (my personal favourite), and some squeaky cheese curds too. You’ve hit the clubs hard, or are pulling an all-nighter and need a midnight (or post-midnight) snack, there’s only one place to go and one repulsive/awesome snack to have. On St-Laurent at Pins, you’ll find “Chez Mein” – a little shack (really, just a window with a counter – I have yet to see anyone go inside to eat). Their specialty is the house “chow mein” for $2; I put these in quotation marks because these are not your regular greased-up chow men of Chinese restaurants. No, they are something much more – first you see them pan-fry the noodles with a bit of soy sauce and oil. When you order one, they ask if you want “sauce” with it – this sauce is straight-up melted peanut butter, no joke. It’s a delicacy that cannot be captured until you try it out for yourself. I will say this: it has a special place in my heart for those brutally cold nights when you’re walking home from a party or a bar far away, and have forgotten all feeling on your feet. If you live in MTL, or have visited it often that you have your own events/spots in mind, I’d love to hear’em. fantasia international film fest 2010: azn films galore! If you’re a fan of independent/sci-fi/azn films and are in Montreal, check out Fantasia International Film Festival for some great film gems, including many fine azn films. The festival kicked off on Jul. 8, but there is still plenty of time to catch numerous film screenings – many of them North American premieres – including free outdoor screenings until Jul. 28. The Executioner (South Korea, 2009, North American premiere)– this film drew a lot of attention and controversy as it was the first film to be shot in an actual Korean prison. The story is about a rookie prison guard learning the harsh and brutal realities of the Korean prison system through a jaded, senior guard. The arrival of a notorious serial killer, whose crimes have garnered much public outrage, opens up the possibilities of a death sentence – a first since 1997 – which threatens to change the lives of the guards forever. A Little Pond (South Korea, 2009, North American premiere): This is another film that met a lot of resistance from the Korean government (and public) due to its critical nature of the American troops (who are often seen as heroes who saved Korea from the Evil Communists). But after 8 years of planning and financial struggle, it’s finally here! The film takes place in a peaceful village in Korea, which turned upside down when the Korean war breaks out, with one of the most brutal massacres of the war on Nonguri Bridge. Power Kids (Thailand, 2008): Move over, Nickelodeon, here comes the muay thai champions. Four friends must unite their muay thai powers to save their friend in a hospital with a heart condition. Other highlights include a digitally restored, original cut of Fritz Lang’s classic film Metropolis at Place-des-arts on July 28 (along with the Fantasia gala) and “Le sang d’un poète,” where Steven Severin (of the Siouxie and the Banshees) performs a live score to Jean Cocteau’s avant-garde film of the same name at the Rialto Theatre on July 22. New to T.O.? Just visiting? A longtime-local who’s never stepped outside your neighbourhood? Here are eight fun thangs and happenangs around the city. Not entirely ‘mainstream’ but not so far off the beaten track that you need an ice pick and bottled water to do them. One of the most beautiful areas in Toronto, and I’m not bluffing! Okay, that joke failed … but the view is for real. The bluffs run for 14 km along the Lake Ontario shoreline in Scarborough. Bluffer’s Park, accessible from Brimley Rd., is probably the most foot-friendly area. I can’t count how many hours I’ve spent at the digital viewing stations since I discovered the NFB two years ago. Settle down in a comfy chair and access more than 5,500 NFB films on a personal, flat-panel, touchscreen monitor. Here’s the clincher: for free. Have you ever ridden the entire subway system in one trip? It’s pretty fun. Take pictures with tacky, fake artifacts at Museum station. Visit Bathurst station’s Bakery On The Go–the best subway bakery in the system. Buy half-priced books at Eglinton station. Enjoy busker performances at most stations. Visit the CBC Museum (free admission!) to learn about the history of Canadian broadcasting. You’ll probably run into a lot of school groups there. If you’re looking for something more grown-up, try to score tickets to a taping of The Hour or The Rick Mercer Report. Stop by the Glenn Gould Theatre to see what’s on. There are usually cool artistic performances, but I prefer the media-related panel discussions they run every once in a while. Farm! In! The! City! Worth a visit if you’re a city snob with no knowledge of, or inkling to visit, farming communities. The farm was my first school field trip as a newly-arrived immigrant to Canada, so I have fond memories of it. From May to October, HT offers free neighbourhood walking tours. If you’re like me and embarrassed to be the only 20-something single person on one of these (okay, to be fair, I’ve only had one awkward experience), try downloading self-guided tours off the HT website. I recommend the Spadina Ave. tour because it’s the only one I’ve done … it takes you through Spadina’s development as an industrial centre and waves of Jewish and Chinese immigration. Bring a date and a camera to the University’s observatory on public viewing nights. This summer, it’s Wednesdays from 9 p.m. to 11 p.m. On clear nights, you can try the telescope with the help of observatory staff. On cloudy nights, there are info sessions and a planetarium show. Now known as Polson Pier, it’s home to concert hall/nightclub Sound Academy, go karts, mini golf and the newly-opened Oh Boy! Burger Market. But the real treat is Toronto’s only downtown drive-in movie theatre. I always approach Canada Day with some hesitance. On one hand, I have good memories of going to Queen’s Park with my parents (when we first immigrated to Toronto) and getting 25-cent hot dogs and paper flags. Over the years, I’ve seen the annual celebration slowly change to better reflect our demographics. There used to only be English and French performances on the main stage, but recently there have been shows featuring other languages. The hot dog prices have also gone up, but that’s another story. On the other hand, July 1 marks another significant Canadian event that far fewer people know about, but that has had tremendous consequences for certain Azn communities. On July 1, 1923, the Canadian government passed the Chinese Exclusion Act, which effectively barred East Azn* immigration until it was repealed more than 20 years later. *Japanese people were sometimes subject to this Act because, y’know, we can’t tell ’em apart. The Act could also be used to prohibit South Azns from entering the country, if they somehow got past another discriminatory piece of legislation, the Continuous Passage Act. The Act came as a response to public and political concern over the growing number of East Azn immigrants in spite of the head tax (which was increased from $50 to $500 in 1903, $500 being the equivalent of two years’ wages). Between 1923 and 1947, when the Act was repealed, less than 50 Chinese people entered the country. Most who were already here were men, leading to the development of a “bachelor society”–one factor that undoubtedly contributed to the desexualization of Azn men we see in popular discourse today. 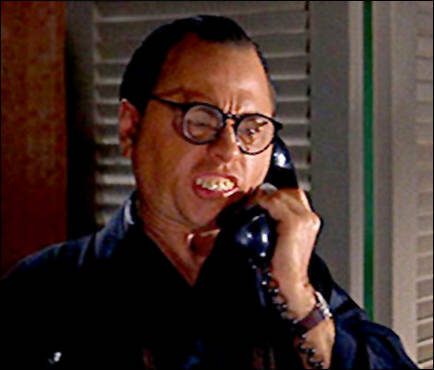 "Harro, I Mickey Rooney playing ching chong man. I ruined Breakfast At Tiffany's wif my yellowface performance." Similar legislation was passed in the U.S. In fact, then-president Roosevelt only called for the Act to be repealed in 1943 because the U.S. Army needed more recruits. Whether in war or on the railroads, East Azns were considered unimportant enough to blow up. After WWII, people of East Azn descent still didn’t have the right to vote. Canadians of Japanese descent had been uprooted and sent off to concentration camps in the prairies during the war. Their now-empty properties in the Fraser Valley were conveniently given to white Canadian soldiers returning from overseas. I could go on, but I think I’ve given you enough to understand why July 1 is known as “Humiliation Day” among some Chinese-Canadians. You probably didn’t learn about this in high school; I grew up in the Canadian public school system and I certainly didn’t. Think about this as you’re celebrating “Canada” Day. And chew on the fact that we sing “our home and native land” in the anthem when, really, it’s our home ON native land. 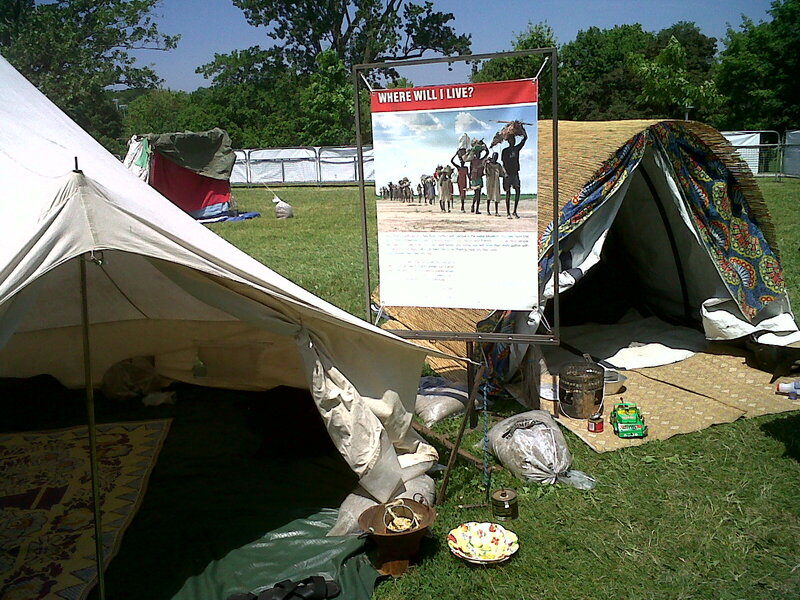 That’s how a Médecins Sans Frontières (MSF) doctor started our guided tour of MSF’s refugee camp exhibit in Christie Pits Park on May 30. 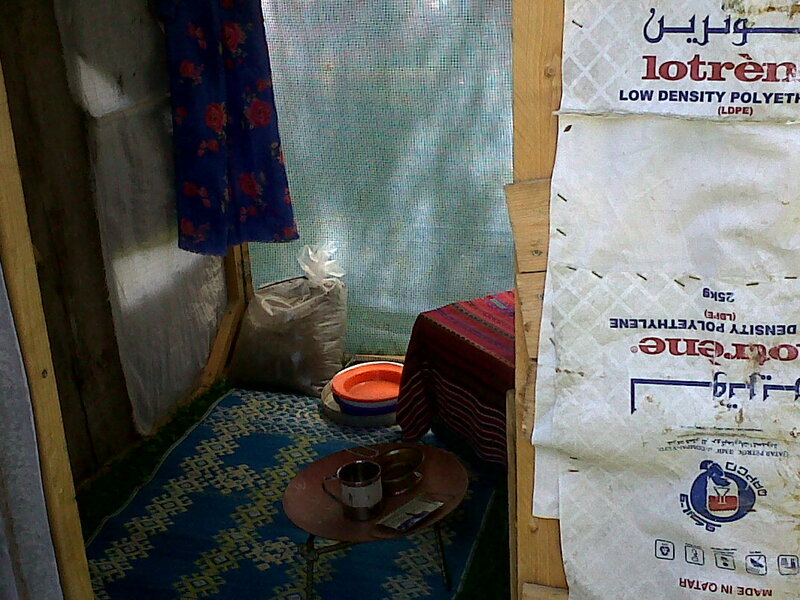 The exhibit was part of an MSF awareness effort worldwide. Multiple cities have played host to the touring camp creation–four in Canada, including Toronto last week. The exhibit wraps up its Canadian tour in Waterloo today. For a weekend, Christie Pits was transformed into a refugee camp, complete with model shelters, latrines and “checkpoints” staffed by actor-volunteers. I’ve never attended a natural disaster or conflict zone firsthand so I’m not qualified to comment on what MSF does there, but, from what I’ve read, the volunteers provide important medical care in the areas they serve. However, although the exhibit was well intentioned, I’m left wondering how effective it is to provide groups of privileged Westerners with a cleaned-up, hour-long experience of camp life. A few in my tour group were snapping photos right and left, exclaiming over how cute the homemade soccer balls were or how tasty the rice rations looked. Errrr … the boat left and you missed it. That’s not to say I was much better than them. I took the photos that accompany this post–on my BlackBerry, no less. It was a hot day and some in the group were sipping Starbucks as we toured. At one point, when the tour guide was talking about land mines, I commented that the mines used in non-Western countries are largely supplied by Western companies. She caught on right away, answering that countries like the U.S. are effectively supplying rebel groups with weaponry to harm civilians. “Canada, too, probably,” I said. “No, no, I’m sure Canada has signed a UN treaty against that,” a sweet but deluded old white lady interjected. Yes, ma’am, if you’re looking at the world through Rosedale-covered glasses. Although it was implicit throughout the tour that Western countries play a large role in cultivating and/or sustaining conflicts in non-Western areas, it was frustrating not to hear that aspect brought out more. I learned new things about medical advances being used in natural disaster zones and a brief overview of the major groups in conflict in the Congo (our guide spent eight months there). But I left frustrated by my complicity towards the West’s role in non-Western conflicts and the realization that there is so little I can do about it. There were moments where Africa and Asia were portrayed as perpetual conflict zones in need of Western rescue. What do you think of awareness events aimed at educating Westerners (that includes non-white people raised in the West!) about non-Western situations?